Do you know why I love China? Because it has no sense of the political correctness that we have adopted in our society. Example? A shopping centre in China has built a car park with wider spaces designed especially to suit women drivers. The women-only car park in Shijiazhuang city is painted in pink and light purple to appeal to female tastes. Officials said the car park was meant to cater to women's "strong sense of colour and different sense of distance". The parking bays are one metre (3ft) wider than normal spaces, he said. Female parking attendants have been trained to help guide women drivers into their parking spaces. The bays also have extra lighting. Tiger just a kitty now. I was inspired by other online sources to try my hand at some creative writing - in this case the objective is to try and write 5 word blog posts. This doesn't mean all my posts are to be abbreviated from this point onward. But once in a while, you're going to come across a post that only contains 5 words, but tries to make a big statement. I just had a thought. Yeah..... it happens. The TV networks and just about everybody else whose livelihood depends on advertising money have been complaining to the world that their revenue stream is reducing to a trickle. Aside from the obvious excuses, such as the recession (which I don't entirely believe anyway), has it ever occurred to the networks that maybe one of the reasons nobody wants to pay top dollar for ad time on TV anymore is because the ad agencies know nobody is watching the crap the major networks seem to be expelling these days? In other words, if you started producing some quality material, maybe you could command those kinds of dollars again. Tomorrow brings to a close the first decade of the 21st century. I have to say, the two thousands were a surprising whirlwind for me. They started with my retirement from the military after 20 years and knowing absolutely nobody in the city I live in (the military can do that to you........ the not knowing anyone where you live part). Worse, although I had spent the last two decades working with computers and other advanced technology, the military doesn't leave you with anything proving that you know what you know. So on the government's dime, Darlene convinced me to take a computer program, so that I'd at least have some civilian credentials. That program landed me a job teaching at that very school immediately upon completion of the program. And the adventure officially began. I taught there for 3 years, meeting dozens of about to be new entry-level IT folks along the way, making some great friends. By the end of the 3 years, I knew a lot of people. I started a blog! (which led to all new friends) My next job was almost handed to me, courtesy of a friendly engineer who passed my resume to HR at a defence contractor firm. I started out as a trainer there and worked my way through various projects and roles and ended my stint as a test technologist. 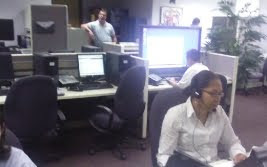 Again, made some fantastic friends and got to do some types of work I had only dreamt of before. I made some fun videos with my friend Bernie as a tribute to Bob & Doug (which almost made us famous). It was a good run while it lasted. At the same time, I got involved with (again thanks to Darlene) acting training and eventually improvisation. Before long, I came to realize that I was less interested in performing and more eager to teach the basics of improvisation, which I got to do with the help of my original acting mentor, Georgette. Loose Moose introduced me to dozens of more fun folks. I also established myself as the go-to internet, technology and security guy at a local Con Ed institution. After getting laid off from the defence job, I waited out the summer to score what is possibly the best job I've ever come across as the sole trainer for an energy company - which I scored in part thanks to a couple of my former students back at the beginning of this story. So, lots of changes, hundreds of new friends, exciting career paths, and finally an exploration of my creative side with the blog, acting and improvisation. I feel like the old me is a complete stranger now. The one thing that has stuck with me through it all is that many if the things I enjoy today would not have been possible without making some key (and for me... risky) decisions. And I have a grand-daughter. Check out this graph of the relative cost of various liquids. Folks, if you need a good cry...... this will do it. I'm not kidding. A brief, heart-wrenching documentary of a man saying goodbye to his loyal best friend, Oden (a dog). Goodness this cat animated short is funny. I've seen a few of these Simon shorts... all good. When I got my new job back in October, I knew that the 15 years I had gotten by in Calgary on all-season radial tires were over. With a 40+km drive each way to work, via wide open prairie highway and a history of white-outs on said highway, I knew I would need better tires to succeed in my commute through the winter. I compromised and bought a set of Nokian WRG2 all-weather tires. For those unfamiliar with Nokian, they make tires that are about 80% as effective as full blown snow tires, while also being suited to stay on your vehicle all year round. 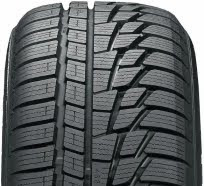 a Look at the tread makes it obvious that these are not your run-of-the-mill all season tires. I did my research and liked what I was seeing, so I took the plunge and tried them out. So far, I am very happy that I made this decision. The tires perform extremely well on our crappy roads considering that they are not de-facto snow tires. I make my commute with an extra degree of confidence. 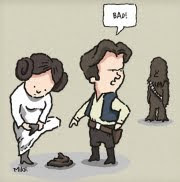 There are drawbacks of course. These tires are only guaranteed for 50,000km, versus the 80,000 my stock tires were good for. They are a bit noisier, but that doesn't bother me. I also notice that due to the tread pattern, the car doesn't quite hold a straight line as easily as with an all-season tire. It's not all over the place, but you can definitely feel a bit of softer steering. This animated short won some awards. It's not hard to see why. Here's a question for my readers: What are your favourite bands or artists that are not from the US, Canada or the UK? If you have no idea where your favourite bands are from, you can always research them on All Music dot com. My faves include Air (France), Hooverphonic (Belguim), Jean Michel Jarre (France), Kraftwerk (Germany), Royksopp (Norway), Sigur Ros (Iceland), and Vangelis (Greece). 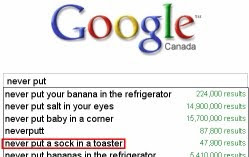 "Never put.... a sock in a toaster." This tee and more are available here. Did we really need a regulation for this? Here's an example of what's wrong with the airlines. The US created a new regulation that forces airlines to let passengers leave airplanes that are stranded on the tarmac for more than 3 hours. And feed them after 2 hours. We had to create a regulation for this. Meaning airlines weren't doing it voluntarily. To the tune of 613 incidents just from January to June 2009. According to The Huffington Post, 12 things that became obsolete this past decade. I'm not in total agreement with #10, although I wish they would go away. And I think #11 is somewhat premature. Who amongst my readers kicks off those clumps of frozen icicles that build up on the the mud flaps (or where the mud flaps would be) on their cars or trucks? Now for my next question - what do you call those things? How much more fun could a wedding be when the bride and groom make a funny video about what life as a married couple would be like (was like?) during the first week. A fantastic look ahead at the wedded bliss of Ryan & Lauren. In possibly the best stunt Improv Everywhere has pulled (to date), I report their Best Buy trick, where 80 agents dressed up in royal blue polo shirts, khaki pants with black belts and black shoes. Then they all poured into a Best Buy store as if nothing was the matter. Then all hell broke loose. "The reaction from the employees was pretty typical. The lower level employees laughed and got a kick out of it while the managers and security guards freaked out." So, in light of the Nigerian guy who tried to blow up a US airliner on Christmas Day (with about the same success as Richard Reid, the shoebomber), I have a few speculative questions. Will the US have to invade Nigeria now? Will carry-on luggage be outlawed? Will the best selling t-shirt of 2010 be "I've got a bomb in my pants!"? Will airport security personnel now need to be trained chemists? Does airport security actually accomplish anything? What's the point of having a no-fly list if not all the terrorists are on it? Can I wear shorts to get through the security gate faster? Underwear? Can we stop pretending that any current wars have any impact on terrorism? What happens when Al-Qaeda successfully recruits a bitter white guy from Cincinnati to detonate a bomb that he swallowed hours earlier? Try this: Go to Google's main search. Without entering a search query, hit the “I'm Feeling Lucky” button. It's displaying the number of seconds left in the year. Best holiday LOLcat so far. 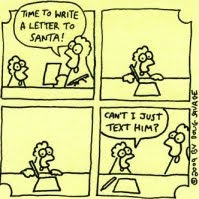 "Time to write a letter to Santa!" "Can't I just text him?" Called The Passenger. Very nicely done. The ending put a tiny smile on my face. I’ve lost count of the number of people I know who have declared or are on the brink of declaring that the traditional gift exchange are to become a thing of the past. Some of those who have yet to declare this (but want to) are only holding back because they’re afraid of the family fallout that might ensue. I’m sure the economy has something to do with it, as is the growing sentiment that the holidays have become so commercialized to the point where the only thing that seems to matter are the presents. I have heard feedback that some folks who have declared themselves a ‘present-free family’ with the exception of the children have suffered a bit of backlash from the rest of their families. There are others still who have replaced the act of giving gifts to all local family members with a gift to a charity on the family’s behalf. How about you, readers? Are you still gifting the same as always, or have your traditions changed? Your thoughts on the winter tire debate? Make it a law to have winter tires on all vehicles by a certain date every year. Offer an insurance discount to those who have winter tires on their vehicle. Allow police to fine drivers who are involved in an accident that do not have suitable tires on their vehicle. None of the above - drivers have the right to use whatever tires they want. "A hilarious collection of upended fairy tales that will recast your classic family favorites in an all-wrong light. Remember those beloved fairy tales you read as a child? Where the damsel in distress is rescued by the handsome prince and then they all live happily ever after? Well Grimmer Tales is just like that. Minus the happy and the ever after! In these pages you'll find classic tales twisted, tweaked, and riddled with morbid humor. Little Boy Blue blows his brains out, Pinocchio impales his dentist when asked if he's been flossing and Rapunzel's head comes off at its stem when her prince charming climbs the tower. Get ready for your nostalgia-o-meter to flicker enthusiastically while shivers course up your spine at the all-wrong acts committed by the heroes and heroines of yesteryear." The UC Berkeley A Capella group, Noteworthy, perform their rendition of Poker Face. Very funny and much more entertaining than the original. Enough data is sent globally from cell phones every day to fill 9.2 million DVD-ROM discs. 210 billion emails are sent every day. These and more internet data statistics here. "...we carefully edit our reality, searching for evidence that confirms what we believe"
Here is a fascinating article about how science often ignores experiment failures for the discoveries that they are. This puts a whole new perspective on why science can move rather slowly to new discoveries. Hershey's plus Calcium.... now calcium-free! 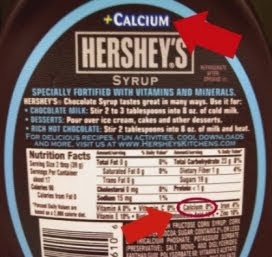 Hershey's chocolate syrup "+ calcium", where the calcium must be cleverly disguised as something else. Because according to the nutrition label..... it ain't gots none. "How many jobs are we talking?" The economic downturn hits Sesame Street. Here's Kermit with a press conference. Thanks to Allison for the find. Would someone care to explain to me why dozens of world leaders and their entourages even bothered to go to Copenhagen, considering what they accomplished while they were there? Was there some kind of magic bong that everyone took a hit from that made them completely not give a crap about the point of the meeting? I will officially go on record as saying that I never been so embarrassed to be Canadian as I was this week, the way our country was represented at those negotiations. Our government had no intention of accomplishing anything of substance while they were there. It has become quite clear to me that the oil economies of the world are now firmly entrenched in their stance of exploiting the world's oil and gas supply until the bitter end, with no plan to reduce emissions nor find a suitable alternative for carbon fuels until the last minute. Damn the environment. Damn the future. It's not our problem. Worse, there are enough sheep who actually believe that world climate change is a myth (like evolution), based on the fact that parts of the world still experience winter. I'm also rolling my eyes at the ridiculous argument that as long as countries like China and India are polluting the planet like ignorant punks, that we shouldn't go out of our way to do anything either. That's like saying that the smart kids in class shouldn't bother studying or paying attention as long as the slackers at the back are acting up. Nate Heagy, a struggling musician from Saskatoon (Canada), decided that a good way to promote himself would be to get on Google Street View. He followed a Street View picture-taking car around Saskatoon, predicted its path and got his image captured. Abilene Christian University in Texas is handing out free iPhones — and then integrating them into their curriculum. Their pilot program's goal was to explore how the iPhone might revolutionize the classroom experience. Think web apps to turn in homework, look up campus maps, watch lecture podcasts and check class schedules and grades. For classroom participation, there’s even polling software for Abilene students to digitally raise their hand. This is the beginning of the end for the traditional classroom, where students depend on a textbook. 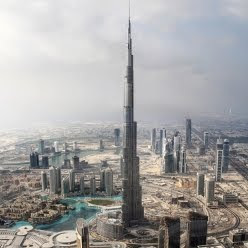 Here's a look at the almost completed Burj Dubai, now officially the tallest building in the world. Dubai is going through a major depression (relatively speaking), but this project is full steam ahead. Once completed they will have spent US$20 billion on a complex that will include 30,000 homes, 9 hotels, 6 acres of parkland, 19 residential towers, a 12 hectare lake, plus the world's largest shopping mall - the Dubai Mall - covering 836,000 square metres (9 million square feet) with 1200 stores. For those who don't know how big that is, the West Edmonton Mall is 3.8 million sq ft. with 800 stores. This mall will have areas for leisure, including a world-class aquarium, fashion show arena, a souk and an ice rink. "Never play leapfrog with a unicorn." 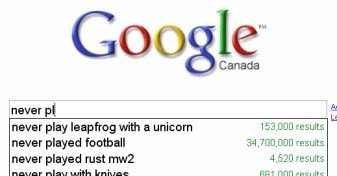 Here's what you get when you Google 'loneliest number'. You know how certain cleaners claim their ability to kill 99.9% of germs? Due to lax regulations, their claims are quite trumped up, as it turns out. It looks like BMW is ready to toss their all-electric car offering into the ring, maybe not as soon as the Nissan Leaf, but apparently, shortly thereafter. The ActiveE looks like a winner, with similar specs to the Leaf, but it seems, a little more oomph. With all the holiday parties available to everyone, wouldn't it be great if you could entertain the crowd with a few cheap bar tricks? Here's a video with 10 easy tricks that will amaze (or amuse) the revellers. Have you ever looked at a word that you just wrote on your computer screen and it just doesn't look right? It's usually a word you've used before, often many times. But this time, something appears wrong with it and you just can't put your finger on it. You may even go as far as to look it up or spell check it to make sure you spelled it correctly. And your research may even prove that the word is fine, but still you are suspicious - it's like you're seeing the word for the first time. That happens to me sometimes. This morning it was the name Rebecca. P.S. : It looks fine now.... the bout of word blindness has passed. But 15 minutes ago when I was writing an earlier post, my brain played tricks on me. Update: It turns out that word blindness or alexia was already coined. Silly me. I must have seen the word in this post and not recognized it...... ironic? I've talked about Rebecca Northan's unbelievable show Blind Date before, when she was in Calgary tweaking the performance before taking it to Toronto. I came across this video of Q TV interviewing her about the show and it reminded me of just how great it is and how talented Rebecca is to pull such an act off night after night. I'm serious folks - if you ever hear this thing is playing near you, you have to go. Get ready to go on the ride of your life. 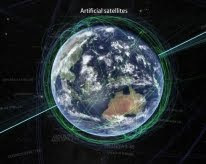 The video The Known Universe by the American Museum of Natural History (part of the Smithsonian Institute) starts off on planet earth and takes you on a journey through the farthest reaches of space. In High Definition, no less. Note how far our electromagnetic transmissions (travelling at the speed of light) have made it since we first started broadcasting. I got straight home from work yesterday and left immediately for a party. Ergo, why there were no blog posts yesterday. Tis the season, eh? So I'm at this party and I had just finished telling a story about school when I was a kid in Quebec. This woman at the party asked which school board I went to and when I replied, she said she knew it well. Turns out this person lived in the same town as I did, went to the same schools, and although we lived in 3 different houses in that town, she moved 3 times and was usually within 3-5 blocks of where we were living. Yet, I don't recall meeting her (she did graduate 4 years ahead of me). This is the kind of thing that starts all kinds of rumours about crazy Canadians, eh? The funny thing is..... this wouldn't surprise anybody up here, even if it were true and not a setup. Hey! How come he gets such a big monitor? Did'j'all know that the band Blondie is still around? S'truth! Go check out their new We 3 Kings Christmas video. Sure, they save money, but the LEDs in the most modern traffic lights have a major drawback. Unlike the old, wasteful incandescent traffic bulb, which melted the snow that built up on them, LED lights don't give off enough heat to melt any snow that builds up on them during a blizzard. I think Cory Doctorow's blog post title pretty much says it all - "Major labels gang up and screw over indie record store", and his post also highlights the injustice of it all considering the stunt the CRIA pulled in the first place. "If I copy yours you have it too"
This video about copying has a catchy tune. I'll be humming it at work tomorrow for sure. 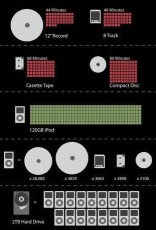 This info-graphic on the evolution of information storage is just great. There's a column each for music, photos and data. Great job showing how far we've come. ...that you may or may not know. Kijiji is a wonderful online classified service that Darlene and I use constantly to recycle stuff (into and out of the house). But of course, like anything else online, the site has been perpetrated by scams of all kinds. At this time of year, the common scam is the “Oh woe is me, my family can’t afford Christmas, so please donate anything you can.... for the kids.” Then you hear about people posting warnings on the same site that they had donated certain items to a down-and-out individual or family only to see the items go up for sale on Kijiji a few days or weeks later by the same person. hello i'm 16 years old and i have 8 brothers (4year old that can't talk that well)and one sister(who has epilepsy shes 10 but may not live til 18) we really don't have that much money and will try to pay some money and can pick up. an baterry power jeep,car we had two but got bruned in a fire that happned at 3:00am......some #$^% set are garage on fire and some of it when't in our house but moved! anyways my little sister loves the littlest pet shops and puerse and barbes and anything girly really. my 2year old brother like the big lego things and frogs and moneys ect. "(^u^)"
my 3yearold brother likes the little legos and candy and cars. my 4yearold brother like cars aswell and flying helicopters and airplants and some real moss for his gekcos that they all share. my 6yearold brother really likes bakugan like likes the cards and the little ball things. my 15 year old brother would like a controller for his ps3 and anything for the ps3. me the 16yearold sister would just like it if anybody could give my siblings anything or anything on the list i would love that so much and thats ALL i want this year...the other years i was selfish.......maybe if anybody has anything for my mom she said she wants a foot spy thing and my moms bf(and my mom)want a male doberman that is 2-4months old....he wants to train it so it won't hurt us and they like coffee. plaese nooo RUDE E-MAILS plasese just keep them to your selfs and THANK YOU TO ALL THE PEOPLE THAT HAVE E-MAILED ME WITH KINDNESS THANK YOU SOO MUCH AND I NO ME AND MY SIDLINGS WILL BE HAPPY THANK YOU AGAIN AND MERRY X-MAS!!! dosint want anything.....but thats all and if anybody has anything that would be so kind to give this to them i really would love this and it would be the best x-mas ever!! thank you for reading this and sorry if its too long.merry x-mas! 10 kids? You would have sounded slightly more believable with 2 or 3. A 4 year old that can’t talk that well? What's the story? Was I supposed to experience a twinge of sorrow for that little nugget of made-up-edness? One sister has epilepsy. Weird - the kid can spell epilepsy, but seems to have trouble with ordinary words like 'please', 'Barbies' and 'purse'. They can pick up the items. I bet they’ll insist on picking up the items, or having them dropped off at some garage bay somewhere, because it’s not likely you’ll get to actually meet the family of 12 with the burned down garage and the ‘gekcos’ (sic). His 2 year old brother likes the moneys. Yeah. Who doesn’t? Mom’s bf wants a male Doberman which he will train so it doesn’t hurt them. No mention of how they’ll manage to afford all that Doberman dog food..... oh and they like coffee (again... DUH!). Hey wait a minute... At the beginning of the story, the ‘little’ sister is 10. Later in the story, the sister is 16. Make up your mind, dude. Come to think of it, there are 2 kids totally unaccounted for. What did they want for Christmas? You’re holding out on us dude. No rude emails. I’m guessing to this point, that’s all they’ve been getting. It's odd how much eyebrows are part of facial recognition. Do you recognize these two to the left? I won't bother telling you, you can see for yourself at the article's site.